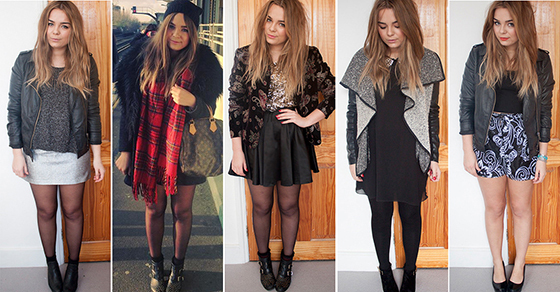 I'm actually a little shocked how few outfits I shot over the period of September-December! I had a blog break for most of September and then was in-between houses for most of October, only moving into my new house to settle into it again on October 20th. I still haven't quite got my outfit posts right yet from my new house. I hate the lighting and the lack of a plain background. Especially compared to my other two sets of images I really like these the least. Its something Im going to have to keep working on but I can see the notable quality difference and it's slightly depressing! They're just missing something and the quality is so off. Argh! Anyway, favourite outfits. I actually adore the Bronze Kimono outfit I wore a few weeks ago with the American Apparel leggings. It's the perfect casual/cool going out look without being too dressy. A super popular outfit of mine was when I wore the elephant grey dress from Love. Even though it was super risqué (the guy I was dating at the time said he could see my belly button in it!) it is a absolutely dreamy dress and the colour is just spot on. I caved in and jumped on the geek/dweeb t-shirts that everyone and their Mum is wearing with almost instant regret! Defintely a band wagon I should have steered clear of but you live and you learn! I've been big on patterned jackets and kimono's as well this season with my favourite being when I wore my Tapestry River Island blazer paired with my faux disco pants and a simple black dress. Some of my party outfits have been good's too with notable nods to what I wore to the Daily Mix launch party and the Vice 10 one! Any favourites from this lot? Let me know in comments! I did really love the elephant grey love dress post, definitely one of my faves too! I really like the non-plain background. But it is your choice :) Two down, four images in is my fav - went out looking for that jumper after seeing it! Love these types of posts Lily! Hope you had a nice xmas! I love your jacket with the fur collar on! this is amazing. love the post! The major difference in your hair colour is so much more noticeable in these posts though, I never realized how dark the top was ombred compared to the blonde now haha. My favourite is the second to last one, with the fur gilet and cross necklace, all in black. I love all black outfits set off with bright gold or silver accessories! Love it! I adore your all of your boots. They give everything a little bit of an edgy vibe! Love the cross necklace as well!